On November 11, 1918, world leaders signed the Armistice, ending World War I and its four years of bloody conflict. Across this week and the weekend, RTÉ will bring a range of programmes and content to audiences, offering extensive coverage of the commemorative ceremonies and unique perspectives on the first world war internationally, the Irish experience, the Armistice, and the centenary of the end of World War I. 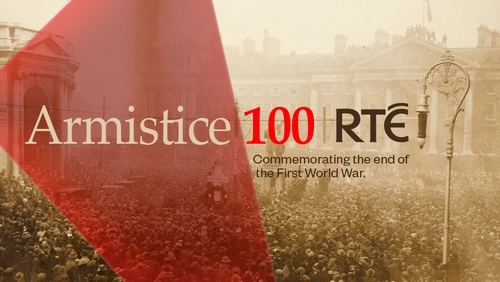 From the Irishman charged with caring for the graves of thousands to the massed forces of RTÉ’s orchestras and choral singers, as well as live coverage of key ceremonies, RTÉ will recognise this unique moment in history, and the sacrifice made by so many men and women during the war. In addition, RTÉ News will carry reports and coverage of events in Ireland and around the world on television, radio, online and mobile. -An Saol ó Dheas. 700 people from Co. Clare died in The Great War, and Clare People journalist Joe Ó Muircheartaigh will be speaking to Helen Ní Shé about it. RTÉ Raidió na Gaeltachta, 12.08pm. -Nationwide. As the 100th anniversary of Armistice Day nears, we journey through Belgium where we meet the Irishman charged with caring for the graves of thousands, and see how the Belgians have not forgotten the sacrifice of so many including the Irish, during the Great War. RTÉ One, 7pm. -Nationwide. More stories from the Front, as we remember and look forward to the weekend, where on the 11th day of the 11th month one hundred years ago, the guns fell silent and the war known as The Great War came to an end. RTÉ One, 7pm. - Arena. RTÉ's arts showcase talks to Professor Chris Evans about One More Yard, based on the letters from Irish solider Michael Wall. Produced by Brian Eno, it features Sinead O'Connor, with a spoken-word piece by Cillian Murphy. RTÉ Radio 1, 7pm. - Concert: Britten’s War Requiem. The massed forces of the RTÉ National Symphony Orchestra, RTÉ Concert Orchestra, RTÉ Philharmonic Choir and Choristers of St. Patrick’s Cathedral under conductor David Brophy promise an unforgettable experience lit up by the contributions of a trio of star Irish soloists. The concert is being offered as part of the EBU's Premium Concert Series and will be broadcast live in Czech Republic and Denmark. Listen live on RTÉ lyric fm at 7.30pm, and watch live here on RTÉ Culture. -Bowman: A special edition of John Bowman's archives programme, to mark the centenary of the end of the Great War. RTÉ Radio 1, 8.30am. -Sunday Miscellany. A special programme on the centenary of Armistice Day features commissioned writers on the theme of remembrance. RTÉ Radio 1, 9.10am. - The History Show Special. The History Show looks at stories of individual Irishmen who fought in the war, and how they returned home to a changed Ireland. The programme will also examine the reaction to the end of the war in Ireland, at this crucial historical moment just before the momentous 1918 General Election. RTÉ Radio 1, 6pm. - The Poetry Show Special. A two-part special opens with the World War One poems of Michael Longley. As Sunday 11th November 2018 marks the centenary of Armistice Day, the interview opens, appropriately, with Michael recalling his father’s experience of World War 1 and reading some of his poems about the war. RTÉ Radio 1, 7.30pm. Audiences can watch back content on RTÉ Player and via RTÉ.ie, users can sample a range of specially commissioned articles, including a selection from Century Ireland.